I’m very happy to announce that 24 Peirce students have now been inducted into the National Paralegal Honor Society. They’ve joined the Peirce chapter of the organization -- Lambda Epsilon Chi (LEX). The induction ceremony took place on April 19, and we were proud to add these high-caliber students into Peirce’s LEX chapter, which now has 120 members. Pictured left to right, front row: Kelly Blair, Mark D'Annunzio, Ann Marie DeLawrence, Danielle Desipio, Wayne Gibbons, Brianne Harper, Prof. Carol J. Sherman. Middle row: Sarah Johnston, Karen Lorenzon, Samantha McCurdy, Nadine Mitchell, Pierrette Pearson, Jessica Reider, Kathryn Salvaterra, Vasfie Tabaku. Back row: Catherine Choi , Melissa Howes, Karen Kapsimalis, Kathleen Moran, Gayle O'Donnell, Rashika Small, Tasha Lee Vazquez-Santiago, Rebecca Watson -- Honorary Inductee 2013 and Peirce alum, Prof. Edwin Miller, Babette Pace -- Honorary Inductee 2012 and Peirce alum, Prof. Cynthia Gentile. Rebecca K. Watson was this year's keynote speaker, and she was inducted as an honorary member into the organization. Rebecca has been a paralegal for the past 17 years and currently works with Marks, O'Neill, O'Brien, Doherty & Kelly, P.C., in Pennsauken, N.J. She graduated from Peirce in 2003 with a bachelor's degree in Paralegal Studies. Since that time, she has served as a member of the Peirce College Paralegal Studies Advisory Committee. She has also served on the Board of Directors of the South Jersey Paralegal Association (SJPA) for the past 10 years. While on the SJPA board, she has served as a representative at several National Federation of Paralegal Associations conventions, and lectures on the evolving role of the paralegal and the paralegal profession at local colleges. Rebecca was also recently appointed to the Board of the Philadelphia Chapter of HOPE Worldwide. 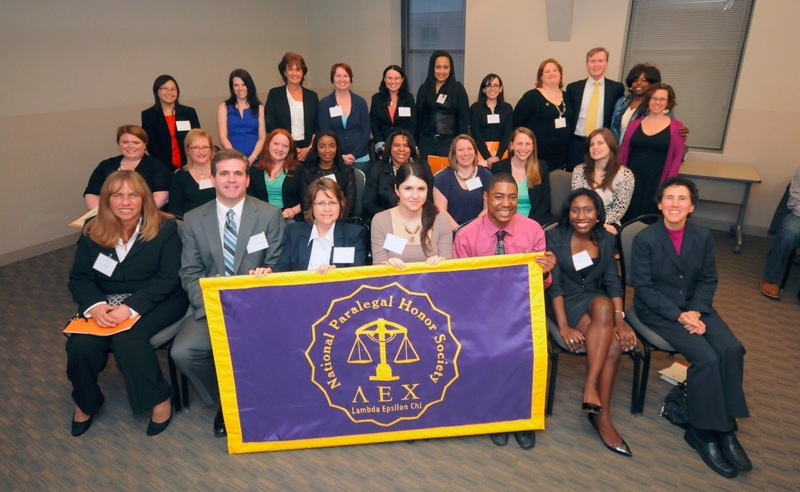 Peirce’s LEX chapter was founded in 2011 to connect paralegal students to national scholarship, networking, and employment opportunities. It also looks great on a resume, and gives members a chance to get to know more about the paralegal profession. To be eligible for LEX membership, inductees must have a cumulative GPA of 3.5 or higher within the Paralegal Studies bachelor’s degree program, or the Post-Bachelor’s Certificate program. Peirce’s chapter of LEX is sponsored by the American Association for Paralegal Education (AAfPE). Congratulations to our newest inductees -- You should be proud of this accomplishment! If you’re interested in learning more about LEX, please contact Professor Carol Sherman at CSherman@Peirce.edu.